In 1861, while Henry was on active duty in the war in Virginia, a different war effort was being played out 3,000 miles across the Atlantic Ocean in England involving Henry’s cousin, the Rev. Francis William Tremlett. Confederate President Jefferson Davis knew that the industrial North would have an advantage of men and materials over the largely agrarian South. To offset this advantage he decided to seek an alliance with the Europeans, and he therefore dispatched envoys to Britain and France months before Sumter. Davis wasn’t doing anything that the American colonies hadn’t done during the American Revolution when they dispatched Benjamin Franklin to France; Davis wanted an alliance, preferably with England. Unfortunately, in the beginning the Confederacy lacked statesmen who were experienced in foreign affairs, and initial overtures to London were largely unsuccessful. The Union also had an advantage by already having an established diplomatic delegation with both European governments. The Union also certainly augmented its “foreign service” as well. An act authorizing an agent to be sent abroad to purchase vessels and arms, and making an appropriation therefore. The Congress of the Confederate States of America do enact, That to enable the Navy Department to send an agent abroad to purchase six steam propellers, in addition to those heretofore authorized, together with rifled cannon, small arms, and other ordnance stores and munitions of war, the sum of one million of dollars is hereby appropriated out of the Treasury of the Confederate States. Soon after arriving in England, Bulloch entered agreements at Liverpool, first with English shipbuilders William C. Miller & Sons, and shortly thereafter with Fawcett, Preston & Company, to build the first of several ships designed as commerce raiders in June 1861. From opening negotiations to delivery, the process was a difficult and risky business. Union spies were conspicuously everywhere. Further, Confederate efforts to procure ships of war were hampered by British legalities. The official position of the British government was abolitionist and militarily neutral with regard to the American Civil War. The Slavery Abolition Act of 1833 had outlawed slavery throughout the United Kingdom, with a few territorial exceptions that would be included by 1843. British neutrality and maritime law were governed by an eclectic collection of archaic laws, agreements, and policies. Foremost among these laws was the British Foreign Enlistment Act of 1819, which included salient provisions with respect to Britain and its involvement in any foreign war. British subjects were prohibited from enlisting in the armed forces of a foreign country or engaging in any activity capable of drawing Britain into a war. The first part was straightforward enough. If you were a British subject, you were prohibited from joining the military at a time of war with any nation with which Britain was at peace. The second part, that prohibited “any activity capable of drawing Britain into a war” was a bit more ambiguous and therefore subject to interpretation. The Foreign Enlistment Act also stated that any contract for the construction of naval vessels in British shipyards for either North or South could not include equipment or fitting them out for war while the vessel was in England. It would seem that this provision would present obstacles for the Confederacy, and it did, but as we shall see, the law was difficult to enforce and not impossible to circumvent because of the phrase “while the vessel was in England”. In the early years of the war, Bulloch and other Confederate agents recognized and exploited this loophole by having British-built ships weaponized in clandestine ports. There was also the Treaty of Paris of 1856. Besides ending the Crimean War, the treaty included provisions that prohibited the seizure of a belligerent’s goods by its enemy from a ship flying a neutral flag unless the goods were contraband. Presumably this was the legal means by which, for example, a British ship could conduct trade with both North and South, so long as the ship was flying a British flag with no illicit goods on board. However, what was the definition of contraband and how could one prove the existence of contraband on a ship on the high seas unless one had the necessary knowledge beforehand? The Treaty of Paris also stated that blockades had to be effective to be honored by a neutral government such as Britain; otherwise, free trade should be permitted. This was an issue in the beginning of the war in which the Union blockade’s effectiveness was questioned: how could the Union Navy effectively blockade the entire American coast from Maryland to Texas? Eventually the U. S. Navy did choke off trade with the Confederacy sufficiently, which removed any doubt or criticism about the effectiveness of the U.S. blockade. Finally, The Treaty of Paris also prohibited any signatory government from enabling privateering, specifically by a letter of marque, which was a government license authorizing a private individual known as a privateer to attack and capture enemy vessels. Privateering was nothing more than piracy with a government’s sanction, but a neutral country that sanctioned privateering definitely risked committing an act of war. Despite the laws, a real fear existed in British minds in 1860 that an “accident” at sea might obligate Britain to intercede on one side of the American war or the other. This resulted in Queen Victoria’s Proclamation of Neutrality in 1861, which was meant to augment and strengthen the generalized provisions of the Foreign Enlistment Act and the Treaty of Paris by lending specificity to the law in regard to the United Kingdom’s involvement in the Civil War. Provisions of the proclamation stated unequivocally that Great Britain was officially neutral with regard to the war but also provided for recognition of the Confederate States of America as a belligerent in the war. Belligerent status enabled Confederate ships to obtain fuel, supplies, and repairs in neutral ports but prohibited them from securing munitions or other military equipment. Recognition as a belligerent did not mean the same thing, however, as recognition of the Confederate States of America as a sovereign nation separate from the United States of America. However Bulloch was undeterred in his task, and he and the English shipbuilders were very crafty about dealing with these obstacles. When construction of a ship began, the builders would identify the ship oftentimes simply by a number. Ships wouldn’t typically be christened or commissioned before construction was completed. When a ship was given a name, it would frequently be a false name, or the ship might be misrepresented as being deliverable to a paper purchaser. An example of this was the Oreto, which was represented as being intended for delivery to Italy but was really destined to be the first British-built seagoing Confederate commerce raider, CSS Florida. As for the Foreign Enlistment Act, Bulloch had shrewdly arranged for the Oreto to be built without being fitted out for cannon, munitions or any other equipment for war. Still, word of Bulloch from suspicious Union agents reached U.S. Ambassador Charles Francis Adams, who immediately relayed the information to Lord Russell. As a result, the Oreto was inspected and searched, but no violations were found. By now Bulloch was residing in one of the Reverend Tremlett’s safe houses. Shortly after the Oreto agreement, Bulloch entered another one, this time with John Laird Sons & Company. In August 1861, the keel was laid for a ship that bore only the number 290, so named because she was the 290th hull to be constructed in the Laird yard at Birkenhead opposite Liverpool on the Mersey River. She would eventually come to be known as the CSS Alabama, certainly the most famous and successful commerce raider of her day, and possibly the greatest of all time. The image at the top of the post is a painting of the Alabama in the Mersey River, Liverpool, prior to sea trials. It’s one of many glorious maritime paintings by the remarkably talented British painter E. D. Walker. The two ships, Oreto and 290, were being constructed virtually simultaneously in separate shipyards belonging to separate builders but in relatively close physical proximity to each other. So much activity couldn’t help but attract the attention of the Union’s consul in Liverpool, Thomas H. Dudley, who had a splendid view of the construction from his office. Dudley contacted his government and dispatched spies to the yards in order to learn what they could, but nothing of use was discovered. Dudley relegated the issue to a lower priority, at least for the time being, since the ships wouldn’t be completed for some time. If there had been any questions that Britain would endeavor to enforce maritime law, despite all of the implied difficulties, the Trent Affair dispelled them. In October 1861, the Confederate government planned to send two new envoys to England with the mandate of pressing the Confederate case for British support. Unbeknownst to the Confederates, the plan fell into Union hands, and as a result, the Union sent the steam frigate USS San Jacinto to Havana, where the envoys were waiting to make passage to England on a British ship. On November 7, 1861, while Henry and the Twentieth Massachusetts were licking their wounds after Ball’s Bluff, the British mail packet RMS Trent embarked with the two envoys, James M. Mason and John Slidell, on board bound first for the island of St. Thomas. The Union captain of the San Jacinto, Charles Wilkes, was familiar with international maritime law, including Queen Victoria’s Proclamation of Neutrality, but concluded on his own initiative that the envoys themselves constituted contraband. Wilkes encountered the Trent, which was flying the Union Jack, around noon on November 8, and fired two shots across her bow before the Trent would heave-to. He boarded her and transferred the Confederate envoys by force of arms to the San Jacinto, which sailed back to Hampton Roads, Virginia, where news of the capture was wired to Washington. Wilkes was next ordered to sail for Boston, where he was further instructed to turn over the captives at Fort Warren, which had been converted to a prisoner-of-war camp in Boston Harbor. 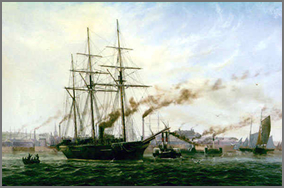 The United States’ ship of war may put a prize-crew on board the West India steamer, and carry her off to a port of the United States for adjudication by a Prize Court there; but she would have no right to move Messrs. Mason and Slidell, and carry them off as prisoners, leaving the ship to pursue her voyage. Lord Palmerston was as mad as a wet hornet. He’d been assured by U.S. Ambassador Adams that the United States would not interfere with British vessels. The Trent Affair would now require a response from the British government in order to defend that nation’s interests and demonstrate some bite in British maritime law, so Palmerston engaged the law officers again. The response was that Captain Wilkes’ actions were found to be illegal and unjustifiable by international law. Palmerston and other British officials began to worry that if the United States snubbed British maritime law, what was next… a U.S. invasion of Canada? This was no joke. Some were concerned that “United States’ manifest destiny” would result in the United States eventually becoming comprised of all North, South, and Central America. Diplomatic relations became strained. Britain sent 10,000 troops to Canada. Fortunately cooler heads and the established bonds of diplomacy between Britain and the United States would eventually prevail. Neither country wanted war with the other, and the issue was quickly diffused in January 1862. The United States moderated its stance, saying that Captain Wilkes had been overzealous in the execution of his duties. The Confederate diplomats were released from Fort Warren, boarded HMS Rinaldo at Provincetown, and eventually sailed for England. United States Naval War Records Office, Official Records of the Union and Confederate Navies in the War of the Rebellion, series II, vol. 2, Navy Department Correspondence 1861–1865, with Agents Abroad (Washington, D.C.: Government Printing Office, , 1921), 66; courtesy of Cornell University Library, Making of America Digital Collection. Bennett, John D. The London Confederates: The Officials, Clergy, Businessmen and Journalists Who Backed the South in the Civil War. Jefferson, NC: McFarland, 2008; p. 63.
 http://en.wikipedia.org/wiki/Slavery_Abolition_Act_1833, accessed December 3, 2015. Baxter, James P. III, “Papers Relating to Belligerent and Neutral Rights, 1861–1865,” American Historical Review 34, no. 1 (1928): Pp. 84–86. Find out more about Colonel Henry Martyn Tremlett and his cousin, the Rev. Dr. Francis William Tremlett during the American Civil War in my book, The Colonel and the Vicar, available on Amazon.com. A long time ago when I was a student there were many occasions to visit, in all its grandeur, The Boston Public Library, and it was always impressive. Fast-forward some forty years, and on the many occasions that I revisited the library in researching my book, The Colonel and the Vicar, the lion sculptures that flank the grand marble staircase took on new meaning. One of them honors the Twentieth Massachusetts Infantry Regiment (shown) and the other the Second Massachusetts Infantry Regiment. Both were commissioned by the veterans of their respective regiment. 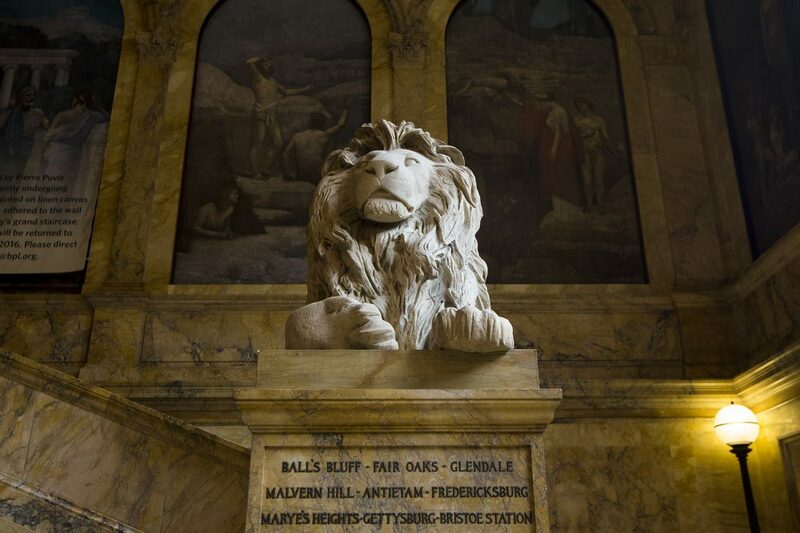 The lions, sculptured in marble, are emblazoned in bronze with the names of the battles which each regiment fought during the course of the American Civil War, including Ball’s Bluff, the subject of a series of recent posts. The works were delivered by their creator, Louis Saint-Gaudens, to the BPL in 1891. The lion sculptures are majestic symbols of an effort made 150 years ago to tell the stories of the brave young men who fought in America’s single bloodiest war. Fourth and final installment in a series commemorating “The Battle of Ball’s Bluff”, first action for Henry Martyn Tremlett and the Twentieth Massachusetts Infantry. In the days following October 21, 1861, word of the defeat at Ball’s Bluff was horribly driven home by the ghastly sight of the bloated bodies of dead Union soldiers floating down the Potomac River as far as Washington. Onlookers were appalled, and outraged government officials called for action. Ball’s Bluff was a small battle that cast a long shadow. General Stone, a West Point graduate and a career army officer, bore the brunt of the blame for the debacle. How could he have allowed troops to engage in battle with no clear path to retreat? He was vilified, humiliated, and even imprisoned for six months. The embarrassing defeat also resulted in the formation of the U.S. Congressional Joint Committee on the Conduct of the War, which sadly only served to undermine Union generalship and initiative for the war’s duration. Why such a lopsided victory? Poor, inadequate intelligence plus a logistical blunder that there simply weren’t enough boats. . . I’m sure that the Union troops had little or no amphibious battle training back in Boston. Perhaps add a modicum of Union overconfidence coupled with underestimating the Confederates. Moreover, the northern troops were mostly green while most of the southern troops had already experienced battle. Finally, the southerners were fighting on home soil and the North was the invader. One fights harder when defending the homeland. Perhaps an extension of the “home advantage” would also be a better knowledge of the lay of the land—all valid points in favor of the Confederates. Taken all together it sealed the Union defeat. Those from the Twentieth who survived returned to Poolesville, Maryland and resumed their former charge of protecting Washington and wouldn’t see action for the balance of 1861. Henry was sent back to Boston to recruit replacements. So ended 1861 for Captain Henry Tremlett and the Twentieth Regiment. However, during that same year, a different war effort was being played out 3,000 miles across the Atlantic Ocean in England involving Henry’s cousin, the Rev. Francis William Tremlett. : The Civil War Trust, http://www.civilwar.org/, accessed October 24, 2015.
 : William Schouler, Adjutant General of the Commonwealth of Massachusetts, Annual Report of the Adjutant General of the Commonwealth of Massachusetts, for the Year Ending December 31, 1861 Boston: Wright & Potter, 1863), 46. Third in a series commemorating “The Battle of Ball’s Bluff”, first action for Henry and the Twentieth Massachusetts Infantry. By the morning of September 21st, most of the troops planned for the offensive had been transferred to Harrison’s island, a 400-acre island located in the middle of the Potomac River, a result of a canal that had been dug on the Maryland side. At 6:00 a.m. General Charles Stone ordered an initial force of 300 men to cross the Potomac into Virginia and the Confederacy. The 300 were selected from the Fifteenth and Twentieth Massachusetts, including Henry’s Company A, and placed under the command of Colonel Charles Devens, a native of Charlestown and a Massachusetts state senator. Devens’ orders were to determine whether it was safe enough to move the rest of Stone’s forces. Devens and his men embarked using four small boats, the only means available, each of which could accommodate at most ten men with gear at a time. The current in the river on the Virginia side of Harrison’s Island was very swift, the water deep, and the soldiers labored mightily. It was a lengthy process, after which it was necessary to scale the 100-foot Ball’s Bluff, described by Captain William Bartlett (20th Mass.) as steep, rocky, and overgrown. When Colonel Devens and his men reached the top of the bluff, he noted that there was no sign of the Confederate camp that Captain Philbrick had reported the previous night. Devens surveyed the terrain that lay before him, a large open field surrounded by thick woods, and he immediately deployed pickets from the Fifteenth Massachusetts forward and to the right of the bluff. The remainder of the Fifteenth was deployed further forward of the center-left, towards a location known as the Jackson House. Five companies of the Twentieth Massachusetts, all under the regimental commander, Colonel William Lee, remained stationed on the center of the top of the bluff to provide an avenue of retreat if needed. With no resistance encountered Devens concluded that the opportunity to move on Leesburg was still there, so he sent word back to Stone to send the rest of the Union force across the river. Stone sent elements of the First California and Forty-Second New York regiments, which would raise the total number of men to about 1700. Colonel Edward Baker, a sitting U.S. senator, was ordered by Stone to take command of the entire field. When Baker arrived, he deployed companies from the First California to protect his left flank and held the Tammany Regiment, under the command of Colonel Milton Cogswell, in reserve. All the Federal activity had not gone unnoticed, and the Confederate commander, Colonel Nathan “Shanks” Evans, had already called for reinforcements. Evans was a capable commander and had already earned a reputation for bravery and as a solid battlefield tactician in the First Battle of Bull Run. Around 8:00 the battle began when an under-strength company (about 40 men) from the Seventeenth Mississippi attacked the pickets from the Fifteenth Massachusetts on the Union right and a small skirmish ensued. Skirmishing intensified throughout the morning as reinforcements began to arrive for both sides, but the Confederates were able to bring more men more quickly to the battlefield over land or rail, while Union troops had to continue to use the slower process involving crossing the river in the small boats. Around noon, nine infantry companies plus three companies of cavalry, all from the Eighth Virginia Regiment, joined the battle around the Jackson House and smashed into the Fifteenth Massachusetts. By 2:00p.m. Devens gave the order for the Fifteenth to fall back towards the bluff. At 3:00p.m. the Eighteenth Mississippi Infantry arrived under the command of Colonel Erasmus Burt who wasted no time in hurling his regiment against the Union center on the bluff itself. The Twentieth was engaged in fierce, bloody fighting before the Confederates were repulsed, but each time the Confederates would reform their lines and attack again. The battle was chaotic, disorganized, and fighting was often at the company or even the squad level. Somewhere between 4:00 and 5:00pm Colonel Baker was mortally wounded by a volley of musket fire that riddled his upper torso, the only sitting U.S. senator to have ever been killed in battle. Over 500 Union soldiers, including Colonel Lee, regimental commander of the Twentieth Massachusetts, were still on the Virginia side of the river when the last of the meager supply of boats was lost. All they could do was press their faces so hard against the dirt so as to burrow into it if they could, while hellfire rained down upon them. Henry was also among those trapped on the Virginia shore and realized that the chances of being killed, wounded or captured were increasing with every passing minute, so he gathered three other officers from his regiment, Captain William Bartlett, Lieutenant Henry Abbott, and Lieutenant Charles Whittier, along with about eighty soldiers mixed from the Fifteenth and Twentieth Massachusetts, the Forty-Second New York, and the First California regiments. Daylight was fading, and they slipped away carefully, making their way upriver on foot, always fearful of ambush at any moment from having so many men in tow. Their efforts were rewarded when they discovered a boat, which was damaged and hardly seaworthy, but they repaired it. Ball’s Bluff was not a large battle, more of a skirmish compared to many American Civil War battles to come, but it was another early Confederate victory and another ugly Union defeat at a time when Washington was growing more and more impatient over the lack of military success. After Ball’s Bluff, the Twentieth Massachusetts returned to Camp Benson back at Poolesville. Members of the regiment that survived the battle were assigned once again to picket the Potomac and guard against any Confederate movement on Washington. They would remain there for the rest of 1861 and through the first few months of 1862. During that time, Henry was sent back to Boston to perform recruitment duty with a request to enlist 200 men in order to replenish the Twentieth Massachusetts’ depleted ranks. : Letters from Henry M. Tremlett, Reports, Letters & Papers Appertaining to 20th Mass. Vol. Inf by Association of Officers of the 20th Massachusetts Volunteer Infantry, Boston Public Library Rare Books Collection; 165:168.
 : “The Fight at Ball’s Bluff,” Our Poolesville Correspondence, New York Herald, 28 Oct. 1861; 5.
 : Letters from Nathan Hayward, Reports, Letters & Papers Appertaining to 20th Mass. Vol. Inf by Association of Officers of the 20th Massachusetts Volunteer Infantry, Boston Public Library Rare Books Collection; 347-348. Second in a series commemorating “The Battle of Ball’s Bluff”, first action for Henry and the Twentieth Massachusetts Infantry. Two more weeks would pass on the Maryland side of the Potomac River with very little action worth mentioning. Perhaps an occasional cannon or musket shot across the river would remind the majority of as yet untested soldiers of the danger not far away. Henry’s regiment, the Twentieth Massachusetts Infantry, along with the Nineteenth Massachusetts Infantry, the Seventh Michigan Infantry, and the First Company of Massachusetts Sharpshooters formed First Brigade under Brigadier General Frederick Lander. First Brigade, along with two additional brigades, plus unassigned regiments, cavalry, and artillery all comprised a division under the command of Brigadier General Charles Stone. Stone was a native of Massachusetts, a graduate of West Point, and had served with distinction during the Mexican-American War. In addition to his military exploits he had been a civil engineer and surveyor. Now in command of a division called “The Corps of Observation”, his orders were to protect Washington from any Confederate incursion. On October 19th, Stone’s original orders were vaguely updated by a telegram from General McClellan to “keep a good lookout upon Leesburg, to see if this movement [several Union reconnaissances] has the effect to drive them [Confederate forces] away. Perhaps a slight demonstration on your part would have the effect to move them.” Besides the propaganda value, Leesburg was also a Confederate transportation hub, and therefore a significant military objective. On that night a deserter from the Thirteenth Mississippi Regiment was captured by Union pickets and brought to General Stone. “General Stone, on examining a deserter, a colored teamster of the Thirteenth Mississippi, was told that the rebels in Leesburg were in alarm because they expected General Stone to attack them, and had sent back their heavy baggage, evidently expecting to be driven back to Carter’s Mills and Manassas.”  This suggested to General Stone that this might be a good opportunity for an attack in the direction of Leesburg. By now, part of the Union force at Poolesville had occupied Harrison’s Island by crossing the Chesapeake and Ohio Canal using four small boats, an arduous, time-consuming task. With McClellan’s wire fresh in his mind, taken together with the deserter’s report, on the night of October 20th General Stone ordered twenty men under the command of Captain Chase Philbrick of the Fifteenth Massachusetts to cross the Potomac before dusk in the same small boats to ascertain intelligence about Confederate troop locations and movement in the area. Philbrick returned with information that he had found a deserted Confederate camp, which further encouraged Stone to consider an offensive movement across the Potomac and at least gain some strategic presence in Virginia. However Captain Philbrick, an inexperienced officer, had misinterpreted a line of trees as a line of tents, and his report back to General Stone that he had discovered an unguarded Confederate camp was inaccurate. General Stone, oblivious to this, spent the night planning for battle the next morning. : Bruce, Brevet Lieutenant-Colonel George A., The Twentieth Regiment of Massachusetts Volunteer Infantry 1861–1865, 24.
 : Newspaper account originally published October 1861 from the Loudon Times Mirror; B. F. Sheetz, Editor & Proprietor – Civil War and Historical Edition, Vol. 162, No. 46, 11/16/1961. The story of the 20th Massachusetts Volunteer Infantry Regiment is part of my book, The Colonel and the Vicar, available on Amazon.com. In the aftermath of their defeat at the First Battle of Bull Run, Union troops had been rushed to the front in great numbers for fear of an incursion on Washington. The Union defeat had been a shock, and Union President Abraham Lincoln replaced then-commander Brigadier General Irvin McDowell with Major General George McClellan. Placed in command of the newly-named Army of the Potomac, McClellan would play an important role in raising a well-trained and organized army, and the troops at Camp Benton were now consumed by daily drills, shooting practice, and strict discipline, including no noise allowed after taps. Camp Benton was situated outside Poolesville, Maryland, on the east bank of the Potomac River, barely 35 miles from Washington. By this day in American Civil War history, a month had passed since the Twentieth Massachusetts left the capital. The west bank was Virginia, so the river was the boundary between the Union and the Confederate states. The relevant part of the river also had an odd topography; the river at that point doglegs southwest to southeast and splits the Potomac River proper between itself and the Chesapeake and Ohio Canal, with 400-acre Harrison’s Island in between. The Virginia shore of the river was dominated by Ball’s Bluff, a 100-foot cliff. Nothing has occurred since I last wrote you until Friday, when the rebels had the impudence to fire 8 or 10 shot and shell across the river. Artillery was immediately sent to the river from Poolesville and sent back 32 shot and shell in return. None of the rebels’ guns did any harm and they withdrew their battery into the woods. . . General Lander detailed my company to march to the river after supper and support the artillery. . . Here we have been ever since bivouacking in the woods, having erected huts to protect us from the dews and rains. I took a stroll at five o’clock this morning, alone down by the river and again later in the morning, and although there are plenty of rebels in the neighborhood on the other side not one was in sight. Whether they will cross or whether we shall go to meet them I cannot find out nor even find anyone who does know—my own opinion is that they shall not cross. War has often been characterized as long periods of boredom punctuated by sudden instances of sheer terror. This was the calm before the storm. For many men new to the army, including Henry, no thoughts, no fears, would prepare them for what they would soon witness and experience. Letter from Henry M. Tremlett, captain, Co. A, 20th Mass., in Reports, Letters & Papers Appertaining to 20th Mass. Vol. Inf by Association of Officers of the 20th Massachusetts Volunteer Infantry, 1868, Boston Public Library Rare Books Collection, 2:162–163. Francis William Tremlett was born in Twillingate, Newfoundland, the grandson of Robert Tremlett, who was born in Devonshire, England, on April 24, 1764, the son of Laurence Tremlett, a textile factory worker, and his wife, Anne. Robert voyaged from England in 1775 at the age of eleven to Newfoundland, then one of the North American colonies of the vast British Empire of the day. Francis began his formal education at St. John’s University in Newfoundland from 1842 to 1846. He wished to pursue the path of becoming an Anglican minister, and in 1846 he would achieve the first step toward that vocation when he was ordained a deacon in the Church of England by the bishop of Montreal. In 1847 he was ordained a priest by the same bishop. Later in 1847, he would bid farewell to Newfoundland and voyage from Halifax, Nova Scotia, to Boston aboard the bark Acadian, accompanied by his mother Elizabeth and siblings Isabella and Louisa. From 1846 to 1851 Reverend Tremlett was also chaplain to the bishop of Newfoundland, during which time he performed missionary work with Canadian Indians, possibly the Inuit or the Beothuk tribe, the latter being a people uniquely indigenous to Newfoundland at the time. Missionary work was a potentially difficult if not dangerous undertaking. The Beothuk were a small tribe, reclusive from European settlers, but on occasion mutual enmity and violence between the two was known to have occurred. In 1849, he travelled to England and married for the first time to Josephine Scarlett Dare at St. John’s Church, Paddington, in the shire of Westminster, London. Reverend Tremlett’s well-connected bride was born Josephine Catherine Bonella Scarlett in Jamaica on September 27, 1806, to Bonella Bowen and Philip Anglin Scarlett, a slaveholder. By 1851, Reverend Tremlett was also Curate to St. Botolph’s Church in Boston, but the relationship with his bishop there soon soured because Reverend Tremlett tried to start his own church for the poor without the bishop’s authorization. The bishop admonished him not to preach there, but Reverend Tremlett ignored the bishop and was therefore subsequently summarily removed after an exchange of acrimonious letters between the two men. After that, apparently Reverend Tremlett had had enough with Boston and it wasn’t long after the St. Botolph’s incident that he booked passage to Europe. He immersed himself in his studies, earning his master’s degree in 1850 and then his doctorate in 1852, both from what was then the Protestant University of Sachren at Jena in Germany. In 1853 Reverend Tremlett is shown as officially finally settling down in the parish of St. John, Middlesex County, London, and set upon the task of doing what his bishop would not allow him to do back in Massachusetts: establish his own church and his own ministry. He would achieve his goal in 1859 with the construction of the Church of St. Peter in Belsize Park, an area northwest of London in the borough of Camden. The church was consecrated by the Bishop of London Archibald Tait and Reverend Tremlett received his incumbency (tenured position of office) in 1860. He now had his ministry and his pulpit, and soon many were drawn to his congregation by his preaching and personal charisma. As word spread, his flock eventually crossed boundaries of the Victorian social class, as among them were members of the aristocracy, the upper mercantile and middle classes, evangelicals, as well as orthodox parishioners. Church attendance grew so quickly that it quickly outstripped the capacity of St. Peter’s, and special galleries had to be constructed to accommodate the overflow. By all accounts, Reverend Tremlett was a fiery orator, a real wrath-of-God, fire-and-brimstone vicar, and he was prolific in raising money for and from his church—and eventually for the Confederacy. The vicarage at St. Peter’s would eventually become known as “Rebel’s Roost,” where Reverend Tremlett entertained the company of many a Confederate over the years, from soldiers and sailors of all rank to agents to diplomats and even C.S.A. president Jefferson Davis himself and his wife, Varina. Much more than just a social gathering place, St. Peter’s became the hub for Confederate communications during the American Civil War, and Reverend Tremlett also provided safe houses in various locations around London during the war years. The South had the greatest economic need for European trade in general, and had the greatest military need for ships. This transformed Liverpool largely into a virtual Confederate port. Indeed, the historian Frank Merli observed, “Soon after the war began, it was said that Merseyside [Liverpool’s county] flew more Confederate flags than Richmond”. Yet England was officially neutral with regard to the war. Further, England was also abolitionist, since The Slavery Abolition Act of 1833 had outlawed slavery throughout the United Kingdom. All of this presented complicated, delicate political issues for the leaders of Queen Victoria’s government, Prime Minister Henry John Temple, Third Viscount Palmerston, also known as Lord Palmerston, and foreign secretary John Russell, First Earl Russell, also known as Lord Russell. If you’re interested in learning more about the book, Amazon has the book, a description, and a generous preview. Even though the book’s finished, this blog will continue with future posts. Hello! My name is Edward Rayner and I’m an independent American author. I’m also an amateur genealogist who derives material for my writing by investigating my family’s ancestry for interesting forebears and writing their biographies within the context of significant historical events. My recent book “The Colonel and the Vicar” is about two of my ancestors that were on opposite sides of the American Civil War… from opposite sides of the ocean… and how there lives intertwined with the historic events of their day. The book also speaks to the considerable international influence on the war, particularly from the United Kingdom. The main characters are Henry Martyn Tremlett, my great-great-granduncle, who became a Union Army captain in the Twentieth Massachusetts Volunteer Infantry Regiment (eventually, a colonel in the 39th Mass. ), and the Rev. Dr. Francis William Tremlett, my ancestral first cousin, an Anglican priest who founded St. Peter’s Church in Belsize Park in Camden, England, and was arguably the foremost English collaborator with the Confederate States of America. Historical events are intertwined with the lives of the central characters, together with many other colorful, interesting personalities that contributed to their stories. Henry and Francis were first cousins to one another. The volume of literature written about the American Civil War is immense, though the scope of the war is thought of by most Americans as a purely American conflict. In truth, the war was very much an international affair, with political intrigue, espionage, and stirring sea sagas that were played out across the Atlantic to Europe and beyond. In most discussions about the war, American history largely focuses on the battles in America while overlooking the political role played by European nations, particularly Great Britain, and the military role played by the navies and shipbuilders involved. In my opinion, those international events greatly influenced at least the length of the war if not events during it, and yet in my opinion these international events are underserved in our history books. I hope that this post generates some interest on the other side of the pond. I’ve written to book stores in the Camden area, even sent free hardcopies for evaluation, and I’m disappointed that my effort has not warranted even a response. If you’re interested in learning more about the book, Amazon has the book, a description, and a generous preview. The attack on Fort Sumter occurred on April 12, 1861. On April 25, my great-great-granduncle Henry Tremlett joined the Massachusetts Militia, fourth battalion at Fort Warren, located on Georges Island at the entrance to Boston Harbor. There he rose to the rank of sergeant in a few months. On June 28, 1861, Massachusetts governor John A. Andrew appointed Colonel William Raymond Lee to command the Twentieth Massachusetts Volunteer Infantry Regiment. Less than three months after his time began at Fort Warren, Henry enlisted in the Twentieth Massachusetts Volunteer Infantry Regiment on July 10, 1861, which was forming up at Readville, south of Boston. The camp at Readville was named Camp Massasoit after the great Wampanoag Grand Sachem, but the regiment was often referred to as “The Harvard Regiment” because many of its officers were educated at Harvard University. Many were also descendants of major figures during the American Revolution, including Captain John C. Putnam and Major Paul J. Revere. Lieutenant Oliver Wendell Holmes Jr., Henry’s first lieutenant, would go on to become an associate justice and later an acting chief justice of the Supreme Court of the United States. Lt. Colonel Francis W. Palfrey may ring a bell for any readers familiar with my home town, as the largest hill in the town bears his name. The Twentieth Massachusetts was organized into ten companies. Henry was commissioned to the rank of captain and assigned to command Company A. A company was comprised of about 100 men. The regiment was initially part of Lander’s Brigade, Second Division, Second Corps. On September 4, 1861, two months after First Manassas, the Twentieth Massachusetts received orders to leave for the front. They left Boston without any fanfare; they simply and quietly boarded trains for Washington. After stops in New York, Philadelphia, and Baltimore they reached their final destination, Washington, on September 7. On September 12, the regiment was given orders to march to Poolesville, Maryland. Poolesville was located on the east bank of the Potomac River, thirty-five miles north of Washington. Virginia and the Confederacy were located on the west bank. The Twentieth was joined by at least two other Massachusetts infantry regiments, the Fifteenth and the Nineteenth, as well as Vaughn’s Rhode Island Artillery Battery and others in the order of battle, all under the command of Brigadier General Charles Pomeroy Stone and ultimately General of the Army of the Potomac George McClellan. The army would remain at Poolesville a full month, assigned to picket duty along the Potomac River, and consumed by daily drills, shooting practice, and strict discipline, including no noise after taps… until October 21st. During the American Civil War, many women served as spies for both North and South. A few of the more notorious ones include Pauline Cushman, Harriet Tubman, and Mary Jane Richards for the Union, as well as Antonia Ford, Belle Boyd (nicknamed “La Belle Rebelle” by the French), and, the main subject of this post, Rose O’Neal Greenhow, for the Confederacy. Maria Rosetta O’Neal was born in 1816 Maryland and around 1830 came to live with an aunt in Washington, D.C. In 1835 she married Dr. Robert Greenhow, a prominent doctor-lawyer working in the U.S. State Department there, and her marriage to the good doctor enabled her to establish relationships within lofty social and government circles. Dr. Greenhow died in 1854. During the period leading up to the Civil War, Greenhow developed strong Southern sympathies. 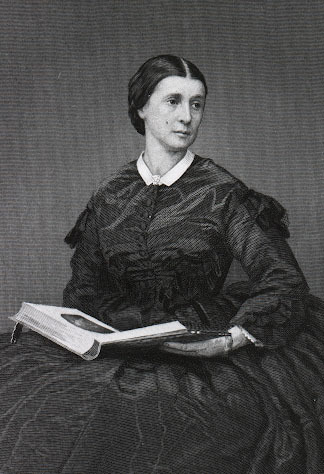 After the death of her husband she was recruited as a spy in Washington for the Confederate States, during which she was able to use her powerful social connections in Washington to gather valuable military information. She is reputed to have provided intelligence to General P. T. Beauregard prior to the first Battle of Bull Run which contributed to the Confederate victory. She was put under surveillance by the head of Union General George McClellan’s secret service, Allen Pinkerton, eventually captured and imprisoned. Released from prison in 1862, she resumed engaging in espionage for the South, and in 1863 she was entrusted with a mission by Confederate president Jefferson Davis to carry important dispatches to England and France. She enjoyed great popularity on the continent, and she is said to have received audiences with both Queen Victoria and Emperor Napoleon III. While in England, Rose was an associate of the Rev. Dr. William Tremlett, the founder of St. Peter’s Church in Belsize Park and the leading Confederate collaborator in London. The vicarage at St. Peter’s, known as “Rebels’ Roost”, was a safe home and meeting place for diplomats, agents and spies, mostly though not exclusively for the purpose of acquiring warships. However as 1863 waned, and the war was turning in favor of the Union, a new effort began at St. Peter’s to bring about an end to the war. To that end, Rose, Reverend Tremlett and Confederate naval officer Matthew Maury formed the London Society for the Cessation of Hostilities in America (LSCHA). The LSCHA sent a petition to the United States government was rejected out of hand by U.S. Secretary of State William Seward because it had not been approved by the British government. The response from English Prime Minister Lord Palmerston was sympathetic but promised little hope of British intervention, and in the end the efforts of the LSCHA had no effect in changing the course of the war. In 1864, Rose boarded the blockade runner Condor with dispatches for the Confederacy and $2000.00 in gold (1864 dollars) which she kept on her person at all times. Unfortunately the Condor ran aground at the mouth of the Cape Fear River near Wilmington, North Carolina while being pursued by the Union gunboat USS Niphon. Fearing capture and imprisonment, Greenhow fled the grounded ship in a small boat, but a wave capsized it and Greenhow drowned, weighed down by the gold sewn into her underclothes and hung around her neck. Rose’s story is part of my book, The Colonel and the Vicar, available on Amazon.com.